Home Unlabelled Airbus A350XWB rolls out of paint shop,prepares for the maiden test flight. 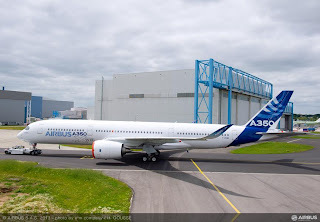 Airbus A350XWB rolls out of paint shop,prepares for the maiden test flight. Airbus pulled its newest airliner, the A350 XWB, out of the paint booth this week and may well be the big story at the upcoming Paris Air Show. The new airplane, like Boeing’s 787 Dreamliner, is made largely of composite materials. The two differ in how the composites are used, but both promise significant fuel savings and increased passenger comfort. The A350 XWB has been coming together with components from suppliers throughout Europe for the past two years or so, and Airbus plans its first flight soon. With the big industry airshow taking place in just over a month, a first flight before the aerospace industry heads to Paris would all but steal the show. Boeing will be there, of course, and is expected to make further announcements about its next new airplane, an updated version of the successful 777, currently being called the 777X. The company also is likely to celebrate the 787′s return to service after two battery meltdowns grounded all 50 Dreamliners worldwide in January. With all of those planes ready to fly again, Boeing announced today that it has resumed Dreamliner deliveries. The two companies took different approaches to building their composite airliners. Unlike the composite “barrels” that come together to create the 787 fuselage, the A350 XWB uses composite panels affixed to a metal skeleton. Airbus said today that it is more confident that the airplane will make its first flight “in the summer,” but wouldn’t be more specific. Depending upon how carefully the company chose its words, that could mean after Paris, which begins June 17 and is, therefore, before the official start of summer. The company is keenly aware that a first flight is just that, and wants to make sure it is a “mature flight” and not a PR stunt held simply to get a plane in the air. The company almost certainly wants to avoid following the same path trod by Boeing, which saw delays and setbacks in the months after the first flight of the 787. In an effort to eliminate one headache Boeing endured, Airbus has abandoned its plan to use lithium-ion batteries and will instead use the more proven and traditional nickel-cadmium cells. 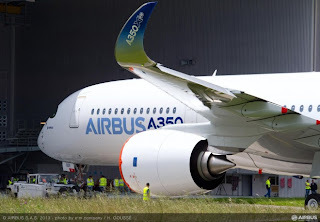 The twin-aisle A350XWB is scheduled to enter service in the middle of next year.